I have progressed from Picking & Pressing to Sewing and Trimming. As shown, my efforts are resulting in three sizes of half-square triangles. Doesn't the brown work well with these scraps? 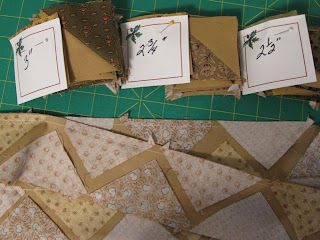 Even though, it is time-consuming to trim the scrap units, and the three sizes may give me fits, I can't wait to get them finished and start playing with arrangement. Yes, the socks are finished, but not without some major frustration. You already know about the knot problem, but as I got further into the skein, my frustrations multiplied. I just passed the gusset on the second sock, when I hit the first knot, so I spliced the yarn and continued to knit while I watched a movie. Distracted by the movie, I did not notice that the colorway was off until I had knit about an inch. When the yarn was knotted by the manufacturer, the wrong end was used, causing the colorway to go backwards! Aaaargh! I frogged the sock back to the yarn change, and then began to rewind the ball to right the problem. Not as easy as it appeared. Remember that I said there were three knots? Well each time the yarn was knotted, it was tied to the wrong end, causing the colorway to switch back and forth. Double Aaaargh! After some expletives, which I will spare you from reading, I got the yarn straightened out and managed to finish the second sock and an almost-matched pair of socks. You will notice that the toe on the second sock is different, a minor blemish. I was so disgusted with this skein of yarn that I emailed the company. I know that I may never hear from them, but at least they heard from me about this naughty, knotty skein. 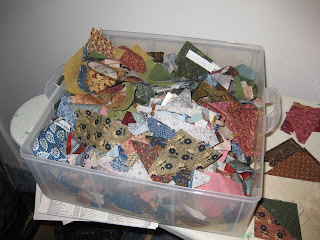 My mission is to clear all the odd scraps from previous quilts out of my sewing room by the end of the year. The box of scraps from Scrappy Spools is my first project. 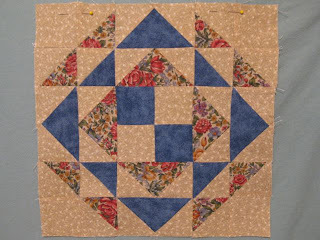 Ironically, Scrappy Spools was also made from scraps of another quilt - Duluth Stars. 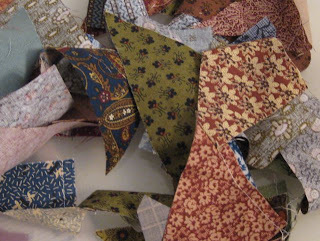 Nearly all of the scraps from Scrappy Spools are triangles, trimmed off of a four-patch to make the spools. 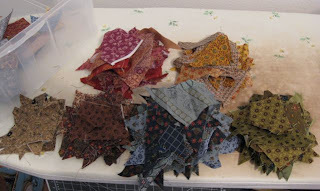 I've been picking the remaining stitches out of these trimmings, ironing the triangles (or near triangles), and sorting them by color. 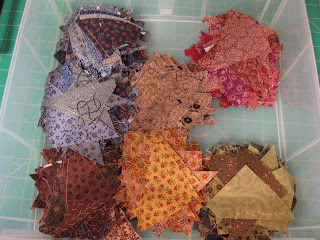 I am going to sew these triangles on a strip of solid fabric (a milk-chocolate brown) and eventually make pinwheels for a lap quilt. Now that they have been picked and pressed, the scraps are ready to be turned into something useful. I like the look of this sock, but I am displeased with the yarn. While knitting the first sock, I found three places where the yarn was knotted, and when I wound the remaining yarn after finishing the sock, I discovered three additional knots. I understand that yarn does and will break during the manufacturing process, but to have six knots in one skein is five too many for me. I do not allow knots in my work and get cranky when I have so many ends to weave. The yarn makes a nice, dense sock. I just do not like the abundance of knots in this particular skein. 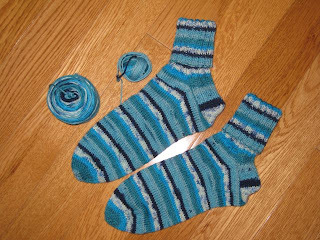 I've had a few people ask how to make a matched pair of socks from self-striping yarn. The trick is to begin the cast-on at a distinctive color change. I make note of where I began and do the same on the second sock. I am seldom disappointed with the result. This pair may change my luck since it is plagued with knots, but so far it is behaving. Since my blue fabric is dwindling, I played around with color placement on graph paper before I made any cuts. This block is called Switching Crowns, and I am pleased with how it looks with the other blocks. You can find the links to all the blocks on this earlier post. 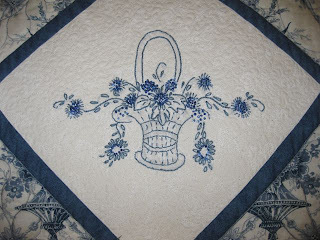 I think there are only three more months for this sampler, so I will have 20 blocks to make the quilt top. 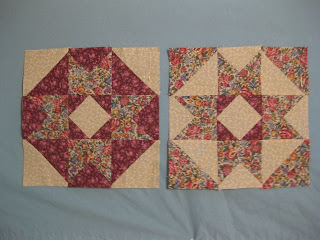 I have decided to place the blocks on point with sashing. As the temperatures start to dip, my thoughts turn to colder days ahead. This year I hope to knit or sew all of my Christmas gifts. 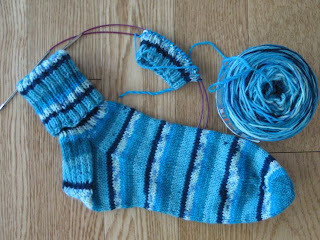 This week, I am a pair of socks closer to that goal and another pair started. 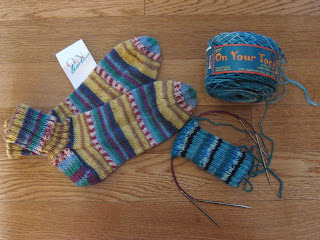 The finished socks were made from On Line sock yarn (75% wool and 25% nylon); the socks in progress are being knit from On Your Toes sock yarn, also 75% wool and 25% nylon. I plan to use yarn and fabric from my stash, so the impact on my budget will be minimal. I took a road trip to Pinedale on Friday and stopped at Red Canyon (east side of the Wind River Range near South Pass) on my way home. I never grow tired of this a beautiful scene. Oh my, what a difference fabric placement makes. I am much happier with this August block! It does not appear as heavy as my first attempt and is much more appealing to the eye. Lesson learned: location, location, location is not just a concept for real estate. Which fabric placement do you prefer? It was so pleasant yesterday that I spent some time in my sewing room constructing another block for the Ugly Fabric Sampler. This block is called Towers of Camelot and is the first of two blocks for August. 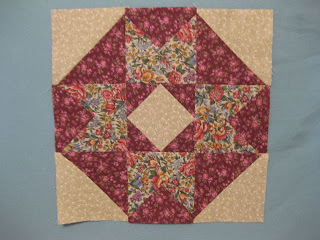 Maybe it is the fabric placement, but this block is not very appealing to me. 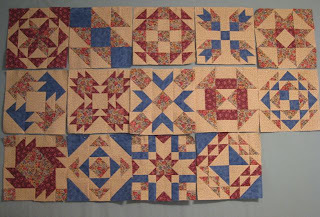 Every cut is crucial now since I am getting short on the burgundy and blue fabrics. Does this happen to your needles? 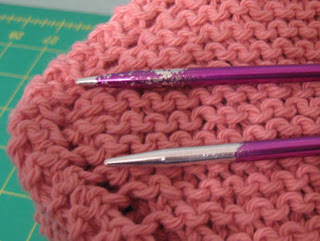 I finished knitting with the pink cotton yarn yesterday. I made 10 cloths from the thrifted cone yarn, with a total of 18 cloths made since the first of August. 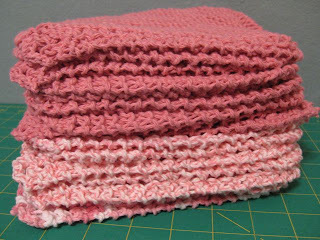 Admittedly, I am tired of pink and tired of knitting dishcloths. It is time to move on to a different project. 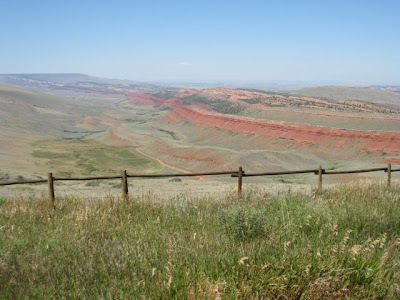 It is nearly impossible not to think about history when driving across Wyoming: the open range, the lack of traffic, and the mountains in the distance all cause the mind to wander and to wonder. The wind blowing across the open country is the same, the mountains and geographic obstacles are nearly the same. What was it like to travel this country on the back of a horse, in a covered wagon, at the yoke of a handcart, or even on foot? What motivated people to give up all they knew in the East for the unknown of the West? As they plodded along day after day, did they regret their decision to go West? 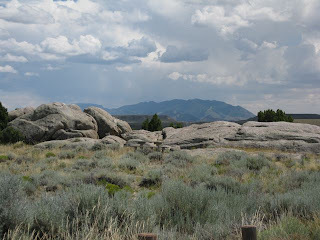 Coming home from Denver last month, I stopped at Split Rock and took photos to show you not only the beauty of Wyoming, but also the strength of our pioneers who traveled the Oregon, Morman, Pioneer, California, and Pony Express Trails through rugged country to reach South Pass, the gateway through the Wind River Mountains. 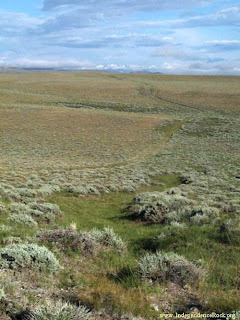 This map shows the trails that crossed Wyoming during the 1800s. On their way to South Pass, the wagons passed through this natural cut in the rock formation. This area is called Split Rock. Split Rock Relay Station, a crude log structure with a pole corral, was built at the base of the mass of rocks. It was used by both the Pony Express and the Overland Stage and until the early 1940s was a U.S. Post office. Because of its unique shape, Split Rock was a well known trail landmark and navigation aid. Emigrants were guided by the rock for an entire day’s travel from the east. It remained in view behind them for another two days. From Split Rock, it was about six days to South Pass, the gateway to the Great Salt Lake Valley, California’s gold fields and the Pacific Northwest. 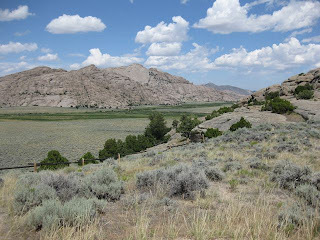 Shoshone, Arapaho, Crow and Sioux Indians occupied this pleasant valley long before the Oregon Trail, which changed their cultures and life styles forever. This led to tragic warfare and the eventual loss of country they had called their own. 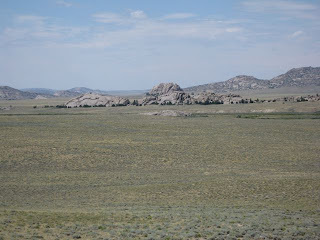 You can get a good idea of the terrain along the rest of the trail on the IndependenceRock.org site and a good explanation of the various trails and its Wyoming landmarks on the Bureau of Land Management website. The Oregon Trail, the main route of westward expansion from 1812 to 1869. An estimated 350,000 people journeyed past Split Rock in search of new lands and new lives in the West. 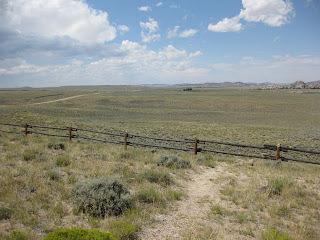 The most impressive view of the Oregon Trail Ruts, however, is near Guernsey, located in southeastern Wyoming. You will find a photo here. I have a photo somewhere in my old albums with my niece and nephew standing in the ruts. The ruts are carved out of stone and are up to five feet deep in places. It is impossible not to feel the struggle of the pioneers while standing in those ruts. I marvel at the determination of these physically and emotionally strong individuals who literally carved the landscape while striving to reach their dream. My journey home paralleled the trail for about forty - fifty miles, yet it took me less than an hour to cover the distance that took the pioneers days to complete. When I think about their accomplishments, I wonder if I would have had the strength and determination to walk in their footsteps. My fingers are crossed that my name will be drawn from that large drum. 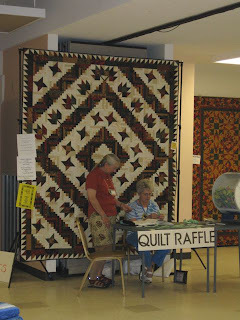 The Never Sweat Needlers' Guild made this quilt for the annual raffle. Proceeds of the raffle will be given to the Dubois Volunteer Fire Department. 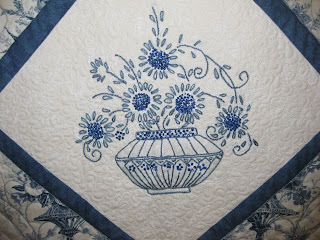 Baskets in Blue combined embroidery and quilting. The color combination is what initially drew me to to this quilt, but oh my, the quilting, fabric placement, and beading embellishments were simply gorgeous. The blue print fabric blocks are fussy cut to perfection. 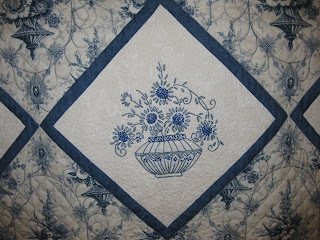 Check out the quilting detail around the baskets, but also note the beading on the flowers. 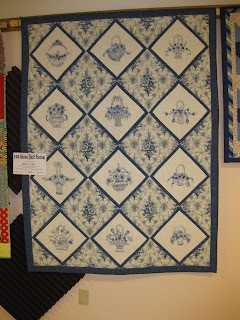 This quilt reminds me of an English summer cottage. Tea and scones anyone? 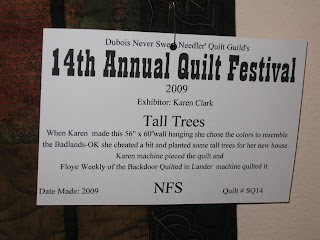 On Friday, I drove to Dubois, WY for the annual quilt show. The display was once more spectacular. The Never Sweat Needlers' Guild is a talented group. 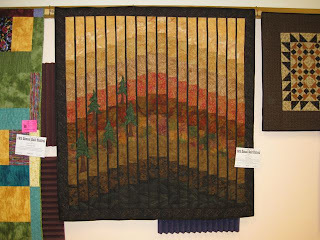 These two quilts were stunning in person. I thought they were wall-hangings, but the identification cards stated they were made for twin beds. Who wouldn't want these works on art on their bed or on their wall? 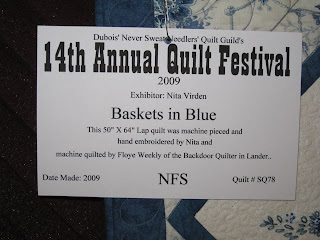 I debated whether to show the identification cards, but since they were on full public view at the show, I saw no need to obscure the quilter's name. Here is another beauty made with the same technique. 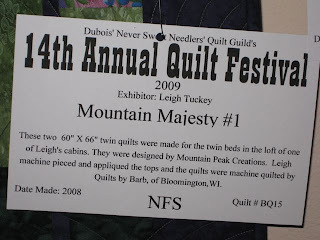 The Dubois Quilt Show is held the second weekend in August (Friday - Sunday). It's well worth the drive. Mary Johnson is one of the most creative and generous people that I know. 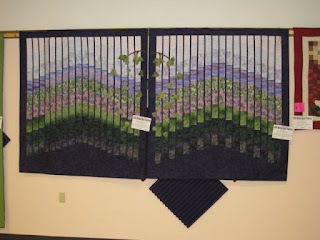 Even though I have never actually met her, I've learned much about Mary's passion for quilting and for helping people from her blog. 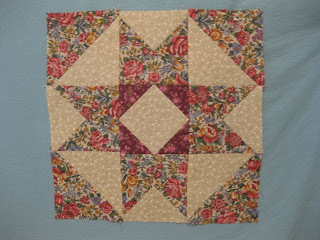 She works tirelessly for the Heart Strings Project by long arm quilting and by piecing tops for the group efforts. She also maintains the group blog and prepares online patterns so others can use their scraps to create blocks for the Heart Strings Project. Several weeks ago, while tidying my sewing room, I decided to ask Mary if she would use some backings for the Heart Strings Project, and she gave me an enthusiastic, "Yes." This was the answer I was hoping to hear because I had a lot of yardage I knew I would never use. The fourteen backings, pictured above, are on their way to Mary and the Heart Strings Project. If you want to help in any way, I doubt that Mary will turn you down. All of my quilts now have labels on the back. 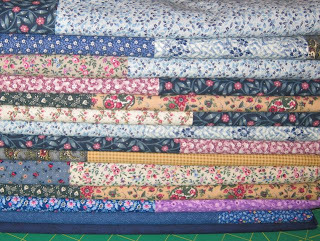 When I gathered all of the ones without labels, I found five tag-less quilts, one from 2005. 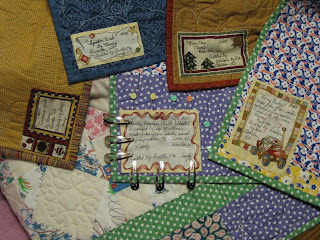 Now, I need to record the story behind each quilt in a journal. If you said ants, you are right! I've been battling these little buggers all summer. 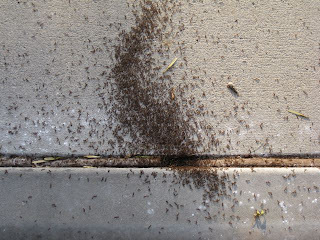 The "hills" appear overnight, but a quick dousing of Ant-B-Gone Dust takes care of them until a week or two later when another batch or should I say "hatch" appears in a different location. They are the tiniest ants (less than 3/8 of an inch) I have ever seen and in the thickest concentrations. I first noticed a hill in my yard about five years ago. The hill was nearly three inches tall and was all ants, no dirt.